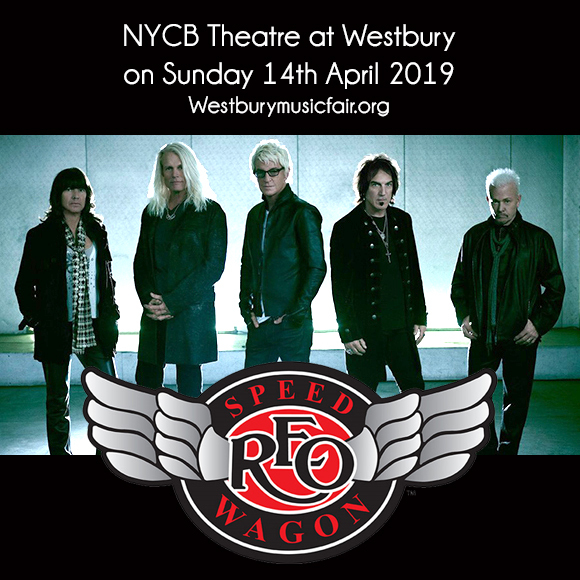 You surely can't fight the feeling of excitement with this piece of great news – REO Speedwagon is coming over for a one-night-only concert performance at NYCB Theatre at Westbury on Sunday 14th April 2019! Indeed, the all-American classic rock band responsible for the all-time fave hits "Can't Fight This Feeling", "Keep On Loving You", to name a few, are head this way to treat the devoted fans for a truly unforgettable evening. For a band who's had an enduring career run, Reo Speedwagon will definitely reel-in their long-time, loyal fans to book tickets early. Don't be left behind. All it takes is an easy click to 'buy tickets' now! Reo Speedwagon has a golden songbook that music lovers have been singing along to all these years. Their power rock ballads have become the soundtrack of the lives of generations upon generations of music fans. Over the course of their career, they have sold 40 million records and collected thirteen top 40 hits, Their songs are not only radio oldies but goodies, but it has definitely drawn in massive crowds in jam-pack venues. Reo Speedwagon is still in full swing in the live concert circuit, dishing out their colossal hits — "I Can't Fight This Feeling", "Keep On Loving You". "In My Dreams", "One Lonely Night. Formed in 1967 in Champaign, Illinois, University of Illinois electrical engineering student, Neal Doughty, along with another original member and drummer Alan Gratzer, founded the band and settled on the name REO Speedwagon. During the 70s, they were starting to build a cult following, which exploded into a mainstream following with the release of the album "Hi Infidelity". From that point on, they skyrocketed to an ultimate career high, which peaked during the 80s. They burned-up the charts and lorded over radio airplays, making them one of the most-revered bastions of all American classic rock.